In continuation to the previous posts and slides. This the last one in the batch day 8 - 10. 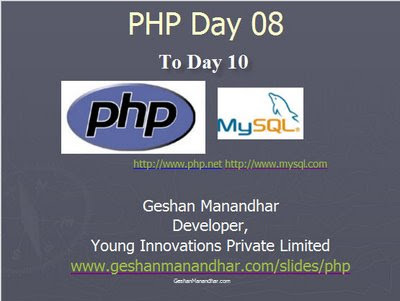 You can learn PHP and MYSQL in 10 days. Get all the slides and code from day 1 to 10 here, or try the alternate link here. Hope you learn PHP and MYSQL in 10 days well :-).